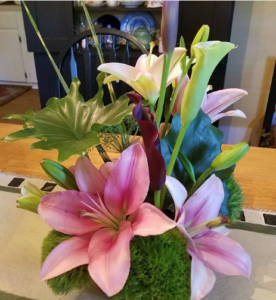 Impress your friends by making this beautiful Ikebana-inspired arrangement that you will be able to recreate on your own with inexpensive materials. Teacher/designer, Shirley Glines of Zoe Jax Gin Designs, will guide you in creating this beautiful Ikebana-inspired floral arrangement. Each attendee will leave with a finished arrangement. Shirley will also teach you how to create a similar design at a later date with inexpensive ingredients.